I’ve been in a crafting rut lately, sitting in my craft room aka guestroom staring at my supplies with no desire to make anything. I decided to wander through Michael’s for inspiration. The bright Mod Podge bottles jumped out at me—a new crafting technique to test out! I remember seeing magazine art on one of my friend’s Pinterest boards, but can’t find the pin I was inspired by. 😦 So this is my version of someone else’s creation. Optional: begin by painting the edges of the piece of wood and allowing to dry. Using the circle cutter or a compass and scissors, cut out concentric circles from magazine pages, each a half inch smaller. (You don’t have to cut out full circles if you know the design you’re aiming for). Alternate between solid colors and patterns if desired. Glue or mod podge the concentric circles together (I used regular glue because I wasn’t sure how to layout my circles). 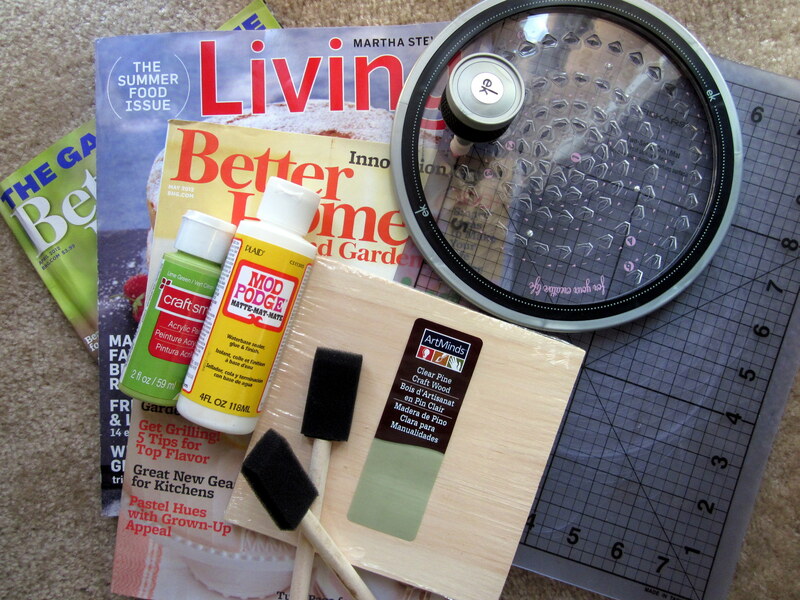 Using a wet paintbrush/sponge brush, cover the top of the piece of wood with a medium layer of Mod Podge. 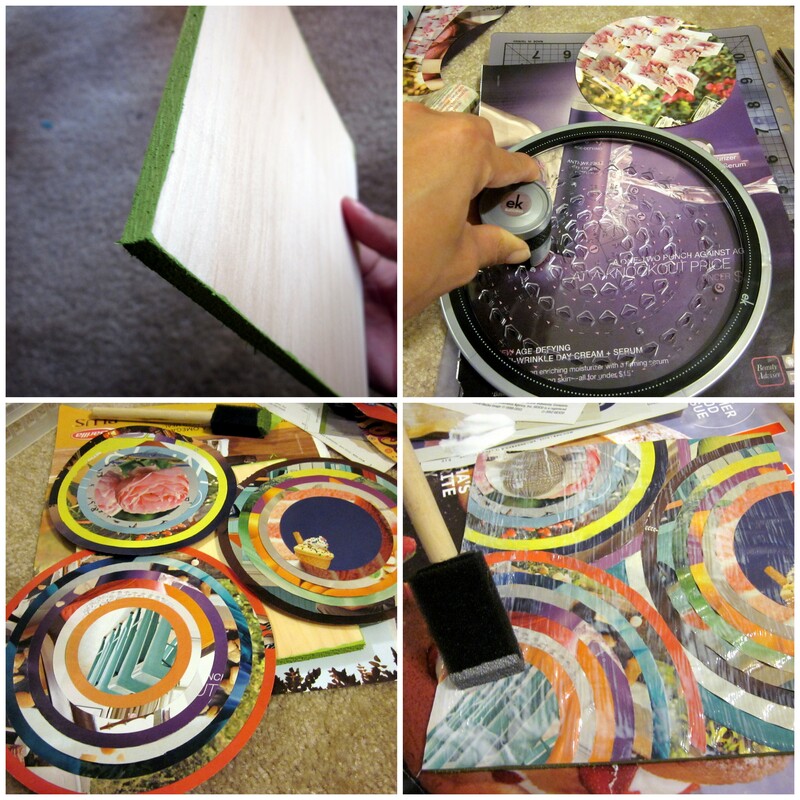 Quickly apply a medium layer of Mod Podge to the back of the circles and press them onto the piece of wood. Wait 15-20 minutes for the Mod Podge to dry. Trim the paper to fit the piece of wood as needed. Apply a medium layer of Mod Podge to the top of the circles. Allow the Mod Podge to dry for at least 15-20 minutes. Most wrinkles should go away once dry. Optional: attach a sawtooth hanger to the back of your creation. This was a fun project to undertake on a weeknight. It took about 2-3 hours mainly because I was indecisive about colors and the layout. I was also limited by my circle cutter—it only cut circles up to 6 inches in diameter. Given that I didn’t look up any tips about using Mod Podge before I dived into my first project, I think it turned out ok.
Are you a Mod Podger? I’d love any tips/ideas. 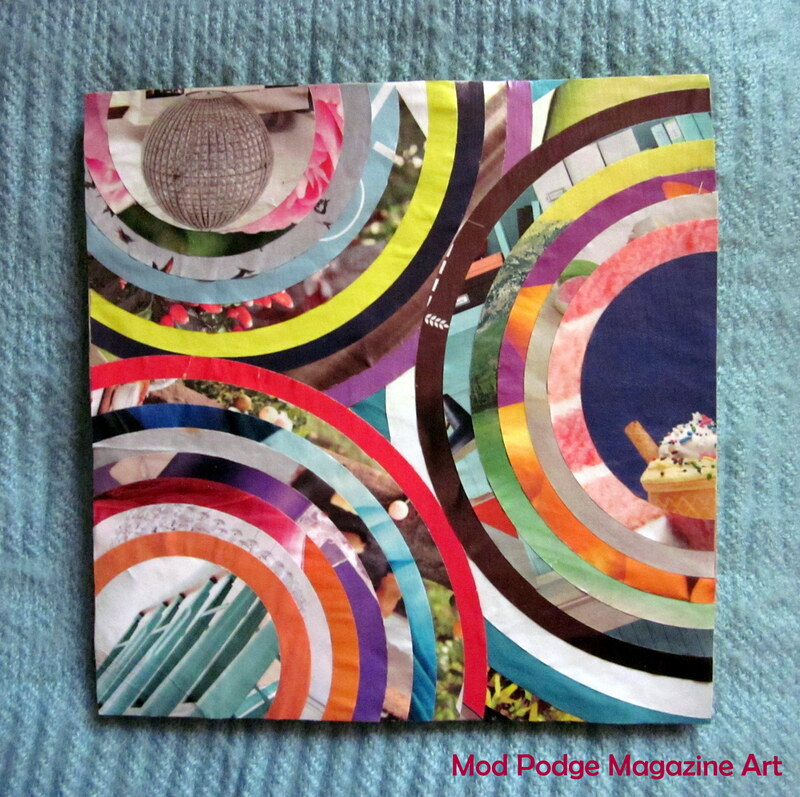 This entry was posted in Crafts and tagged Collage, Magazine, Mod Podge, Recycled. Bookmark the permalink. 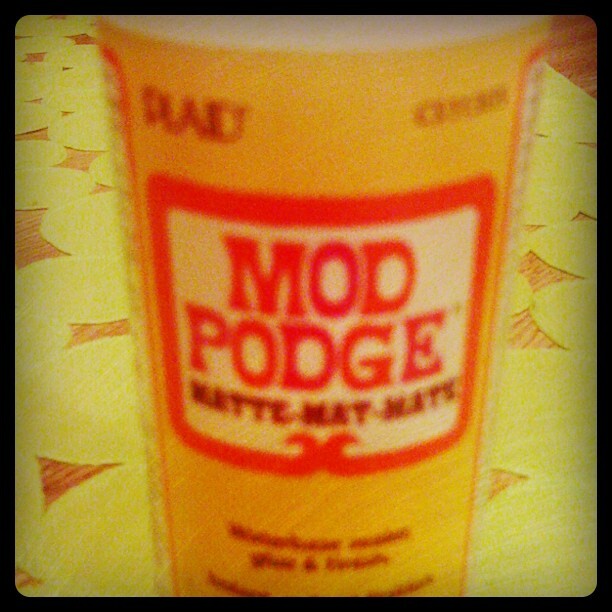 Mod Podge is so versatile! I’m currently using it to tint clear glass bottles I’ve been collecting. Reusing and repurposing for decor is awesome. Rock on!